Today I’m sharing some “fun facts” about turkeys from the “My Life as a Turkey” site. There are five subspecies of Wild Turkey in North America. 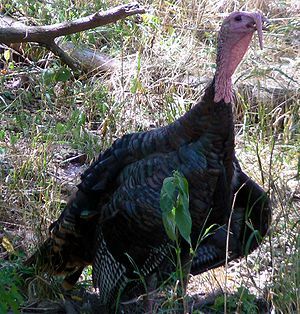 Male turkey’s weigh between 11 and 25 pounds, females, 5-12 pounds. Turkeys can run up to 25 mph and fly at 55 mph. A turkey has 5000-6000 feathers. (give or take). Turkeys can make at least 30 different calls. In the Nature episode, Joe Hutto remarks about the extent of a Turkeys vocabulary. The North American Turkey was quite the world traveler. Aztec turkeys were taken to Europe by the Spanish conquistadors. These turkeys became very popular throughout Europe. English colonists brought those turkeys with them to America. You can find out more about this, here. To write about turkeys around Thanksgiving is obvious and even cliché. But spending some time thinking about turkeys also reminded me how often I don’t look, really look at what is around me. I am surrounded by fascinating, complex beings of all sorts who I take for granted- if I notice them. Calvin: Wow, it really snowed last night! Isn’t it wonderful? Hobbes: It’s like having a big white sheet of paper to draw on! Calvin: A day full of possibilities. It’s a magical world, Hobbes, ol’ buddy… Let’s go exploring. Posted in Animals. Tagged Joe Hutto, Wild Turkey. Thanks Ben. I appreciated your post on the show also (http://www.notonesparrow.com/blog/) great minds… Calvin and Hobbes was one of the classic strips. Happy Thanksgiving to you also. Although I know I’m late (I was out of town) – but a great post for the day .. after all, the only one I saw with facts about turkeys. Hope you had a bountiful holiday weekend. Thanks.Turkeys, as it turns out, are interesting creatures. Hope your Thanksgiving was great.